The Rotary Motion Sensor lets you monitor angular motion precisely and easily. It is direction sensitive. You can use it to collect angular displacement, angular velocity, and angular acceleration data. Typical experiments include measuring moments of inertia, torque, pendula, and Atwood’s machine experiments. 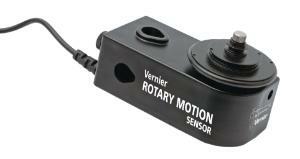 Even though we call it a Rotary Motion Sensor, it can also be used to measure linear position to a fraction of a millimeter.